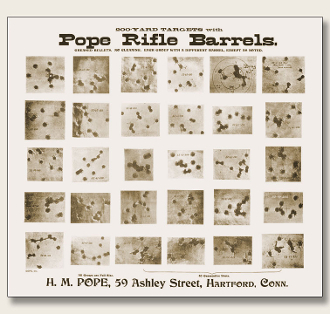 This advertising circular by H.M. Pope features groups shot with Pope barrels in a variety of calibers. Harry believed in backing up his claims to accuracy with targets and many famous riflemen sent him their best groups. On heavyweight paper with an old-time look, this ad is suitable for framing and is great piece of artwork for your gunroom or shop.